18V, XRP 1/2" Heavy Duty Adjustable Clutch, Cordless Hammerdrill/Drill/Driver Kit, 3 Speed Variable Speed Reversing, 0-450/0-1,450/0-2,000 RPM, Hammer Mode In Maximum Speed, 0 - 34,000 BPM, 1/2" Ratcheting Chuck Lock, Anti-Slip Comfort Grip, 500 INLB Of Torque, Includes 1 Hour Charger, 2 XR Pack Batteries, 360ree. Side Mid Handle Grip, Double Ended Screwdriver Bit & Carrying Case. Having blown a few corded hammer drills over the last 15 years I finally decided to try a good cordless model to get rid of the irritating cord. Did some research and came upong this drill which seemed to pretty much offer anything you can possibly want in a cordless drill. I have not been dissapointed. I really don't know how I ever got along without this tool. The balance of the tool is great. It feels really well in your hand. Its a little on the heavy side but pretty average and to be expected from a NiCD 18v drill. The tool balance really makes it feel comfortable anyway regardless of the weight. The keyless chuck saves so much time and grips bits as good as a keyed one. The three speed transmission is very versatile and has as far as I can tell the highest RPM speed (2000rpm)for a cordless drill which is very useful for masonry applications. The middle speed (1450rpm) is great for when high speed and higher torque are needed such as hardwood, holesaws, etc and finally the slowest (450rpm) for maximum torque and driving. Most cordless models only have slow and fast, and fast isn't that fast, pretty frustrating for masonry work. The battery life is very good. The 18v XRP battery should provide enough power to work reasonably continuously while the other is finished charging. I can many times go a full day of extended usage without having to bother recharging. Finally, the reason I really bought this drill, the masonry performance. 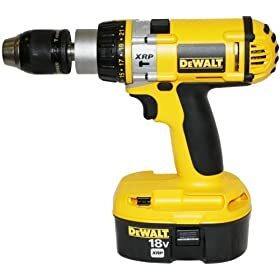 Remember this is a hammer drill, NOT a rotary hammer. A rotary hammer is far more powerful but is pretty useless for anything else as they are typically to large, heavy and too violenty powerfull for smaller work. This hammerdrill I have found can easily outperform even many corded hammer drills. Lately I've been using it to drill mainly into insanely hard 40 year old structural concrete columns in a building and driving tapcon screws in. I would normally use a rotary hammer for this but rotary hammers tend to oversize holes so tapcons don't grips as well (or at all). With a good bit the drill powers through pretty effortlessly into the reinforced columns. Softer stuff like brick and blocks, it plows through with no sweat. I give this tool the full 5 stars. It's by far the most versatile and best performing tool in my box. If you need a cordless drill that can do everything and replace all others, this is the one. 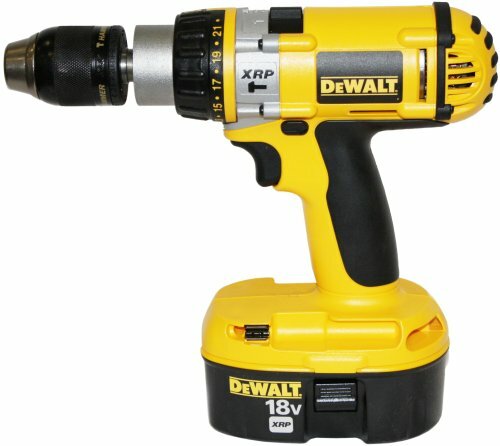 I have owned Dewalt 18 volt drills since they were 2-speed models years ago and this drill meets and exceeds my expectations. Very powerful, and well balanced with great run-time. I own 3 of these drills and use them for driving lags to building doghouses. Dewalt's quality is very impressive and they have never let me down. I wanted to buy this drill as a single product, but the stores all carried it in a package with other power tools. Amazon offered it as a single. It arrived the next day even with standard shipping. I am greatly pleased with both the product and its performance and with Amazon and the speedy deliver! What is up with this drill? First. I have a workshop, barn and truck bed full of Dewalt tools and I would give every one of them a five or four rating. But this drill was nothing but problems for me and I returned it. The chuck adjustment was terrible, the speed(transmission switch) would not stay locked in position and the final straw was the distinctive sound of metal on metal and a wisp of smoke. This was within the first five hours of use. Given the number of great reviews this drill gets I am willing to accept that I got a lemon. I was not willing to take my chances on another. Just returning the drill is a long trip for me and we need tools that we can rely on. Our work is often done way "off the paved road" for you Foxworthy fans. A competitors product in the same price range has been used and abused for a month now and is going great. Sounds like Dewalt has some real quality control issues on this drill. If you buy one hope you get one of the five star drills and not a one star like I did. I bought this cordless to use with a 6" Lazer ice Auger. My expectations were based on other ice fisherman recommendations. I was pleasantly surprised and satisfied with the results. The Dewalt was able to handle the job easily. I used an Beaver Bay 10" long adapter between the auger cutting head and the drill, but added a strap, just in case the auger pulled free of the drill (problem for some I talked to). I found that I could drill about 10 - 15 holes on a charged battery, depending on the ice depth of 10 - 18 inches. The best part of it is not having to carry a heavy gas drill around... no startup and warmup. I can drill 3 holes in the time it takes others with gas augers to drill one hole. I carry both batteries along and I keep them warm to get the maximum power and life. I use this drill every day. I actually have several on the site along with a lot of other DW 18volt tools. You could definitely say that a lighter model like the 14volt DeWalt is more convenient for drywalling. And the hammerdrill function is only useful for very light work, like drilling the occasional anchor hole in brick. It is absolutely not a substitute for a real hammerdrill, even a small one like the Bosch bulldog. Nonetheless, it's very handy to have a drill like this in your holster. It can do 95% of what you need if you're doing basic residential home construction or remodeling. If you're a hobbyist, you could probably go with a lighter model, but this one really takes a beating. I abuse it - use it for things that I shouldn't, like running a mixing paddle for thinset - but it still runs straight and clean, handles finish work well. It's just a well-made tradesman's standby. I don't see how you could go wrong with it. product was almost exactly what i wanted, dewalt 18v hammer/drill/driver was great and delivery prompt and better than expected delivery date. but as selling to international clients maxtool could/should disclose more information about battery charger input voltage (as australia is different to united states)output voltages mentioned in detals. minor detail but some small details are important.